I did not understand, and I mean, not at ALL, what was happening in fashion (like, am I completely out of it? Tell me what you think at the end of this article) – when I saw the HIDEOUS Balenciaga sneakers (I’m not being mean: the whole point of those sneakers is to be hideous: they’re called ugly sneakers apparently) on the feet of all the fashion girls (the term fashionista is banned from now on, by the way) and the EVEN MORE HIDEOUS IF IT’S EVEN POSSIBLE Gucci sneakers (enormous, covered in gemstones, completely absurd, but it seems to be working). I knew this whole thing had been started by nutso Kanye (he’s just as talented as he is insane). So anyway, very short shorts, super cropped t-shirt (the mother had the disillusioned look of those moms who are exhausted and ready to accept anything at this point) and huge, and I mean HUGE SNEAKERS. And you know what? I thought she looked great. Super well dressed. Suddenly, it was a good look. You know what I mean? When all you need is one image to realize you just didn’t get it before? So, that was the moment I realized I was skipping over a pretty important fashion trend. So here we are now, I’m rectifying my mistake on this day of October 2018. Since then, with my curiosity piqued, I stopped at Flight Club (THE sneaker store where you can find all the collectors including Kanye’s $2000 shoes) and I bought myself some Pharell sneakers. I have absolutely no idea when I’ll wear them, considering how flashy they are, but here again, I’m just realizing even more how the sneaker craze completely passed me by. Here I thought we were becoming more and more conscious of the future of our planet. That’s what people have been saying about kids these days. most of them don’t care thhhaaaat much, just like we didn’t really care at their age. The only thing they want is to be cool in their $2000 sneakers. But then again, don’t count on me to be the judge. It’s easy to say “buy better, buy less” after spending the better part of my thirties changing shoes four times a day. So, in conclusion: if you want a pair of sneakers that really stands out, or even a pair of HIDEOUS sneakers, now is the time. You can get them at just about any price and there are even some brands that are more environmentally friendly than others. Coat, Nili Lotan; T-Shirt, Shaina Mote; Pants, Vince; Sneakers, Fila; Bag, A.P.C. All sneakers are HIDEOUS !!! I agree! I go to great lengths not to wear them even when I’m on my feet all day. Glad I can pick and choose my fashion trends to follow. Passing on this one. I still love the way Garance tells her stories. Bien sûr qu’on veut voir tes nouvelles baskets ! Cela fait plusieurs occasions où je me rends compte que je me mets à trouver jolis des trucs que je trouvais immondes quelques mois plus tôt, comme les chaussettes légèrement hautes avec les baskets par ex. Idem pour les grosses baskets. Attention quand même, les baskets immondes à petit prix ça peut vraiment abimer les pieds (car elles sont très très très très raides). Quant à Kanye, j’ai pensé à lui tout le temps d’une course le week-end dernier à cause de mes écouteurs, et je m’étais lancée une idée débile comme je fais souvent, genre si je fais mieux que mon chrono de l’an dernier, Kanye arrêtera d’avoir ses drôles d’idées actuelles. Hélas j’ai une mauvaise nouvelle, je n’ai pas réussi à améliorer mon chrono ! I still don’t get this trend and I’m a millennial. It’s just one of those trends that I know I will never be able to get on board with. And IF there ever comes a day I think to myself that this looks good, I’ll be freaking out because it will mean I’ve been brainwashed ? I feel your pain and confusion over this trend, I’m still not quite ready to embrace it. I am warming up to the high top version, somehow they seem more in balance with the heavy sole. Anytime fashion embraces a style that’s comfortable, especially in footwear…I cheer! Do they have to be so… large? Inflated? They are so… cartoonish! Even in white. Must we leave behind our slim little converse or sleek, bright, tennis shoes? Je n’aime deja pas les chaussures blanches alors les enormes baskets avec des brillants ??!!! Je porte des sneakers (gris) pour faire du sport mais je comprends l’attirance des trucs a la mode, surtout quand on les voit portes par des filles magnifiques. Fashionista maybe out but fashion victim is still, in!! Ugh, no. Tall, pretty, skinny 14 year olds look good in nearly everything because youth is pretty. But even they can barely pull these off, in my opinion. I think they instantly make every outfit look less put together- like you’re an office worker at lunchtime who changed out of her real shoes into her walking shoes to go power walking. Moi j’arrive pas à craquer pour les “modes extrêmes”, enfin, c’est l’effet feu de paille un peu, à la pointe de la mode pendant quelques mois et après trop la honte, ça devient in-revendable sur n’importe quel site et ça prend de la place dans les placards…: un peu comme les “baskets ultra-compensées” d’Isabelle Marant puis copiées partout il y a qlqs années : un tas de copines en portaient, je trouvait que ça faisait shoes orthopédiques…tombées aux oubliettes et in-ressortables désormais ! wow that is so cool. love (and need) comfy shoes and how fashionable! great post. ah mais oui qu’on veut les voir ces baskets! et moi quinqua assumée ça fait bien longtemps (au moins 6ans!) que ça fait ma signature tout porter même les jupes crayons, les robes fleuries ou les vestes de smoking avec des baskets! On peut dire même que je suis une “sneakers addict”! “Immondes” ou pas comme tu dis mais ça casse tellement le côté “dadame” de toutes les tenues surtout en étant secrétaire de direction on a vite tendance à se sentir dans un moule caricature. et oui je suis à la recherche des sneakers chunkies qui me feraient de l’oeil! et puis on est tellement bien dedans! I completely didn’t get these sneakers. When we were in Italy in May – all the window were full of them…yuck! Then the other week my impossibly tiny Korean friend showed up wearing a pair. Okay…very cool and comfy looking. However, as an almost-60 woman, I’m just saying no. They don’t look chic or cool on me…they just make me look geriatric. Gotta be in touch with how casting would see you (if you were an actor!) Not every trend looks good on everyone. Except for 20-somethings…they can wear burlap bags and rock ’em. So I’m letting the kids have their fun. I’ve been watching this trend and waiting. I found a great pair of Unravel Project sneakers on Net-a-Porter that are in my shopping basket. Very excited. I’ve been wearing Vans but need an update. This post was very timely. I’d love to see how you wear them Garance. Please post when you do. Have had the exact same thoughts – shall I…. shan’t I….can I wear these aged 46?! Oh the dilemmas we have ??? Well. I’ve been around fashion enough to spot a trend-to-be when I see one. I remember following closely the style of Gemna Gvasalia and his brand VETEMENT, and I saw the first pair of ugly dad sneakers he came up with. LOVED IT, as everything he does and knowing his 90’s Street Style / Hip-Hop influences and inspirations, I knew it came from the trend of FILA’s sneakers, very popular back in the 90’s. And since he’s the AD of Balenciaga, he made it a major trend with Gucci and Louis Vuitton following. Hell, even Stella McCartney got into it. But more than spotting a trend-to-be, I know how to make the difference between a trend and an over-hyped trend. And the ugly dad sneakers is one. Give it 2-3 seasons, and they’ll be has-been. Which is why, I made the smart move to not pay for a 1000$ pair of ugly sneakers (I am a millennial, but I ain’t dumb with my coins) and got myself a pair of old times FILA fat white sneakers. Cheaper and gave the same results in style. Overall, I like the trend.. and I tolerate all models from all houses. But meh… now watch the trend fade away. I love you Garance and love your writing! This is where my big but comes . I reread this post just to make sure I understood , and now my last gay nerve is being worked over . Much todo about our attempts to always be on trend , something’s are aesthetically UGLY. Wether we give in or not , us fashion lovers must stop being lead around by designers and brands and call something’s what they are HIDEOUS. Thanks , love ? you all . Cleansing deep breath… No thoughts whilst exhaling. Assessment before next breath…ugly, yeah definitely ugly, no need for ugly ( feeling like Rainman here). So, although fascinatingly ugly, I still gravitate toward pretty. No Dad sneaks for me (at this moment). La je passe mon tour volontiers. Toutes les personnes qui sont convaincues aujourd’hui reconnaissent que spontanément leurs réactions étaient simplement de les trouver laides (ok c’est le concept) et ont été converties par l’effet mode. Je trouve ça un peu pathétique. Surtout quand on voit 1) le prix 2) la quantité de plastique. A la limite je pourrais tolérer chez les sextagenaires ou plus pour le côté ironique. Bcp mettent en avant le confort mais il me semble qu’on a pas la attendu la dad sneaker pour pouvoir trouver des modèles cools et conforts. Love them. Thye just have this sexiness when you put them together with ankle baring wide pants. This isn’t going anywhere. But there is also a nice place for simply classic Reeboks. Thankgoodness high heels have gone away. People keep trying to bring them back, because no matter what anyone says or does they look silly. You can’t run in heels, you can’t evenwalk on uneven ground in them for long. Yes, of course, we want to see your sneakers! BTW this trend reminded me how I used to hate the fact that I wear 39 / 40 size and ALL sneakers looked horrible on me : big foot, tiny calves. Now, everyone is wearing them no matter how they look on you because that’s the very purpose of it. So be it. I am not going to buy a new pair of sneakers, but I think this liberation of minds is a good thing! Too ugly. And as someone said above, anything will look good on a tall skinny teenager. But with age comes the sense to understand what is simply a trend, something I would convince myself to wear just because everyone else does, and what I do actually like, feel comfortable in and know suits me. These sneakers are simply ugly and expensive for the sake of it. In a few years they will look dated (Isabel marant high heeled sneakers looking at you). I’ll stick to my classic superga or white converse for summer, Stan Smith or black converse for winter. My guess is that the young person you saw at the mall would have looked good in anything… it wasn’t the sneakers! 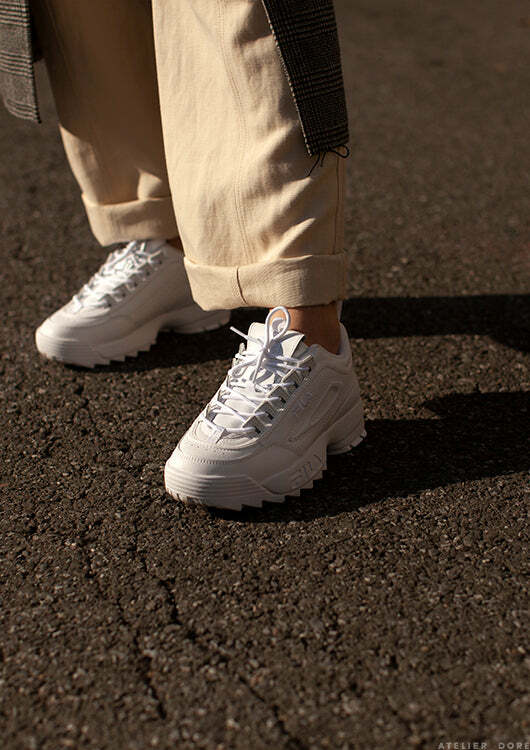 I think if you lived through that sneaker fashion of the 1990s (remember white sneakers, black linen pants and a white t-shirt – made ‘the thing’ from that show that I think was called Mad About you) you don’t ever want to make that mistake again. Anyway this was such a funny post. Ahh ahah j’ai cru que j’étais la seule folle à trouver ça hideux!!! contente de voir que je ne suis pas totalement larguée!! Totally cool with that, because at least they are comfortable. As long as fashionable shoes are comfortable, I can forgive them for being hideous! Je comprends le confort mqis je trouve ca tellement moche. ? J’ai pensé exactement la même chose des UGG. Et puis… j’ai vu une silhouette qui avait su les dompter. Donc, j’ai fini par acheter des UGG ! Lors des dernières FW, j’ai pensé la même chose des cyclistes! Mais là, non, non, non! Même si je vois une femme qui a su créer une belle allure avec un short cycliste, promis, je ne craquerai pas !